I wish to thank three very special musicians who enriched my life in the first five years of the 21st century. 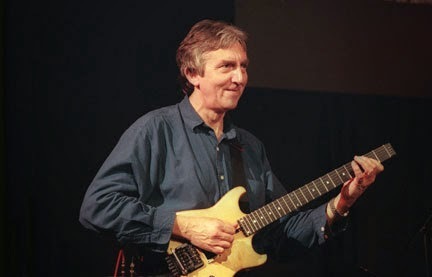 First of all, you need to know about Allan Holdsworth. Allan is, for my money, the greatest guitarist and composer of modern electronic music on the face of the planet. This, from someone I went to see in concert three times in three different cities. This, from a guitar hero to thousands of music fans world -wide. I finally managed to tell him how great I thought he was and he just looked shyly at the floor and put his arm on my shoulder with a gesture of immediate friendship and camaraderie. We both being smokers at the time, stepped outside to have a cigarette. I told him about the time I saw him in concert when his technician was having one hell of a time trying to get all the outboard gear working. Allan smiled while taking a drag on his cigarette and told me he’d be right back. He returned shortly with a copy of his new album at the time. He then asked me for my phone number and soon he left off into the night. Two days later I got home from LA where I was visiting friends and checked my messages. There was one from Allan asking me if it wouldn’t be too much trouble to open up solo for two concerts of his trio. There would be one concert in LA, and one in San Diego. “...If it wouldn’t be too much trouble!” Are you kidding me? Of course I got back to him as quickly as possible. This guy is so great that he negotiated my fee with the concert promoters and ran around to collect my money for me at the end of the gig! This is another example of pure Class of the first degree. Although I was thrilled to have been asked to open up solo for Allan and the trio, I will have to admit that I was a bit apprehensive. After all, his fans might not “plug in” to my wacky versions of American standards. Once again this was a very risky move on my part. The first gig was in San Diego at the “B” street theater. The place was jammed. I set up my amp on the left hand lip of the stage, did a brief sound check for the house engineer, then drifted back to Allan’s dressing room to say hello. He jumped off the couch to greet me and introduced me to his musicians with a warm series of compliments. He did his best to make me feel as comfortable as possible under these “dare devil” circumstances. I thought to myself: there are perfectionists and then there is Allan Holdsworth. After moving to France, I didn’t see Allan for over three years. He played in Nice, France in October of 2006, and I went to see him. After the show I went backstage and when he saw me, the first thing out of his mouth was, “...I’ve never forgotten your guitar playing”. This statement goes way beyond a compliment into the area of the “unbelievable”, coming from such a genius and truly, one of the nicest people on the face of the planet. I’m not sure when I will be able to see Allan again, but I will certainly always remember his gracious manner and impeccable genius. Mark moved to San Diego in the early part of the new century and we met at his premier solo concert in San Diego at the Museum of Art in Balboa Park. 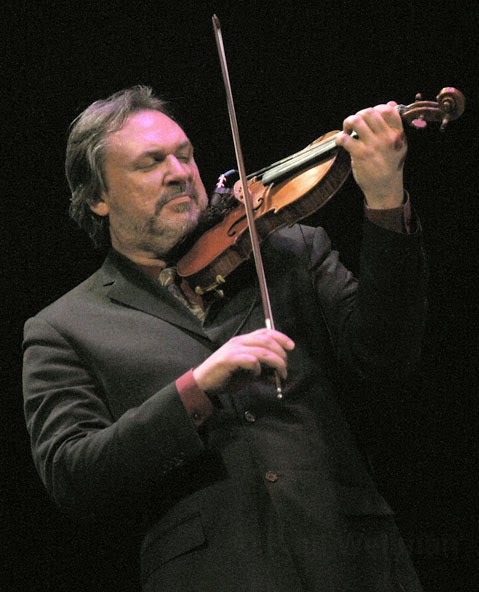 Mark came out on stage and for an hour or more amazed all in attendance, including myself, with his incredible fiddle “wizardry”, touching bases with Texas style, Bluegrass and Celtic fiddle as well as as a solo tribute to Stephane Grappelli which was truly heartfelt. I found out later that Mark had played guitar for Stephane when he was in his teens. On the day of the festival, I took the stand with my trio and played an opening piece. I didn’t see Mark anywhere, but what the hell, maybe he just couldn’t make it. Then, while receiving applause from the audience, I saw Mark out of the corner of my eye, ready to go, fiddle and bow in hand. I announced to the audience that I had a special surprise for them, and onto the stage he came to tumultuous applause. We played, and the trio did their best to provide him with fire and good energy. The crowd went wild and after our brief musical encounter, he left the stage to listen to all the other jazz guitarists featured that day. There were about a dozen great players including, Peter Sprague and Mundell Lowe. Two days later, Mark called me to come and rehearse with him at his ranch in North County. Thus began a musical relationship that lasted over a year. At the time we had first met I was in the middle of preparing a special series for the San Diego Museum of Art, entitled, “The History of Jazz Guitar”. The opportunity to become involved with this project was solely due to Wes Brusted, the managing director of Museum Special Events at the time. Wes is one of those unique entrepreneurs who constantly searches for unusual performance packages that offer to the public real artists doing real art. It has totally been my pleasure and privilege to work with Wes Brusted over the years. At any rate, while preparing the weekly programs for the theater at the museum, I had planned on one evening dedicated to “Swing” guitar and its history, including a live performance of the “Hot Club” of France repertoire that originally featured Django Reinhardt and Stephane Grappelli. I knew it was a little ballsy on my part, but I called Mark O’Connor to see if he would be interested in participating in this series and of course, if his busy “touring” schedule would allow it. He said that he would check with his management in New York and get right back to me. Thirty minutes later he called back to tell me we were on. Mark had been a “Sideman” for decades before we met. I wasn’t completely sure how to handle the rehearsal and the gig itself with Mark there. After all, he was and is a huge star. What would his attitude be like? I should have guessed. On the day of the gig, he was on time and ready to go, waiting for my instructions on solo order, tunes to play and where to sit on stage. He had completely adapted his consciousness to a “Sideman’s” personality. It was my gig and he was there to help. The budget wasn’t very huge and although he had accepted what I’d offered him, in the end, he told me to keep the fee, it had just been a pleasure to play together. An encore example of class personified. During that time we worked together, we did concerts and club gigs in a quartet setting in and outside of San Diego. Mark was also generous enough to endorse my first violin CD, “Bar Talk” with Dwayne Smith on piano. I helped Mark out at his famous week long “fiddle camp” held in San Diego every July into August, and learned a great deal from this mild, jovial virtuoso who continued to encourage me about my fiddle playing by featuring me in a two-violin concert later on at the same theater in Balboa Park in San Diego. There I was on stage with Mark, swapping licks and loving every minute of it. Mark wanted to interview me between tunes we played together to ask me questions about how I got into wanting to play the violin and to inform the audience about the rigors of trying to play the violin: possibly the hardest instrument on the face of the planet to become involved with. Everyone in attendance, including Mark and the band, broke up and the rest of the night went beautifully. Mark is a very giving person by nature. Everyone who has ever met him knows that his philosophy of life is simple: to be a great human being is just as important as being a great player. 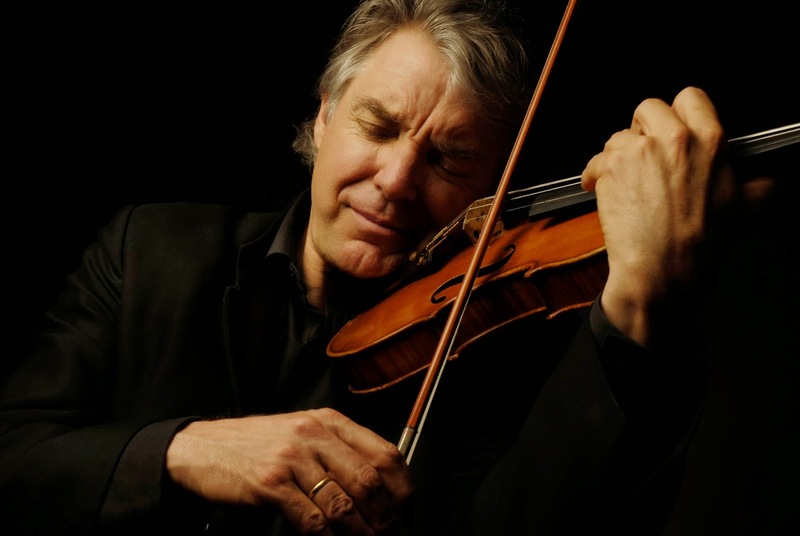 Finally, last but not least, is the French jazz violin virtuoso, Didier Lockwood. I first met Didier at the Juan Les Pins jazz festival near Antibes. I was performing with a trio of French musicians and Didier with his trio. I went backstage and introduced myself by telling him I was playing guitar with Mark O’Connor before I moved to France. He warmed up to me immediately and noticed I had my violin case with me. We immediately began talking violin and the French press took a picture of us together, he with his arm wrapped around me smiling profusely. Didier is not that well known in the US. In Europe, he is the successor to Stephane Grapelli, and he also plays alto sax, trumpet and piano wonderfully, and is a great composer to top it off. A true contemporary genius, he is equally at home with traditional jazz and the most modern of new music concepts. About one year later I noticed that he was doing a duo concert in Biot, an ancient village about forty-five minutes from Monaco. I took a chance and wrote a short composition for him, and took it with me to offer it to him if I might have the opportunity to see him before or after the concert. As luck would have it, I arrived early and found that he and his pianist were dining in one of the small bistros near the medieval church where the concert was to be performed. I hesitated to approach him, but then he noticed me and waved me over. He gave me a warm hello, introduced me to Dimitri Naiditch his pianist, and invited me to join him for a glass of wine. While we were talking, he noticed the package I clutched under my arm and asked me what it was. I told him that it was just a little piece I had written in dedication to him. He motioned to me with his arm to offer it up immediately. He took a brief look at it, thanked me and set it down on the chair next to him. A few minutes later, his manager arrived to tell him that they needed to do a brief sound check for ten minutes or so and then to return to continue their dinner. Didier grabbed the music and told me he’d be right back, as he and Dimitri headed off to the church. Patricia and I finished our meal and headed for our seats in the church. The concert was fantastic, as Didier and Dimitri wove in and out of classical and jazz themes with the most expert of improvisational dialogue. Then it happened. For the encore, Didier stepped up to the microphone and told the audience how touched he was when anyone wrote a piece of music for him. My heart began to beat faster. He announced my presence and told the audience that he and Dimitri would “try” to play my piece as an encore. They played it beautifully and gave me the thrill of a lifetime. Totally unexpected, these world renowned musicians performed one of my meager efforts on the spot as if they’d been playing it for weeks. This is the kind of kinship that real, dedicated musicians are known for. We are all brothers under the skin and this type of generosity and recognition is shared by nearly all artists who have paid their dues and strive for greatness, whether or not they ever achieve that elusive term, “great”. I have spent a lifetime dedicated to, and working within the structures of that art form known as “Music”. I was never destined to become what some would refer to as “Famous”, but I have had the privilege of contributing my meager skills for over four decades, side by side with many great and “Famous” performers in the role of a “Sideman”. As I explained in the first few pages of this book, music found me, I did not find music. Fortunately, I was in the right place at the right time and reaped the rewards, and paid the necessary dues to see the world and experience the friendships and talents of so many creative people. Truly, I have lived and continue to live a blessed life. By the way, the lady downstairs is continuing to improve on her piano. I have no doubt that someday she’ll be giving a recital somewhere in the neighborhood: I’ll be there.